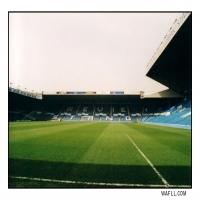 The Spion Kop at Elland Road was built in the 1920's and attained its name from a hill in South Africa. During the Boer War 322 British soldiers lost their lives on the hill and many football teams named their stands after Spion Kop hill in tribute to the fallen men. The original Kop was all terracing and built on an embankment, at this time the Kop had no roof. In April 1968 the old Spion Kop terracing was stripped away in no less than six weeks and in its place the new Kop was built complete with a roof and new name. The Elland Road Kop was now known as the Gelderd End. The new stand cost £250,000 to build. In 1994 as a result of the recommendations in the Taylor Report which was published in 1990 the Gelderd End became all seater. 7,000 seats were added to the terrace reducing the stands capacity by just under 3,000. The Gelderd End was the final stand at the Elland Road stadium to acquire seats. The new look Kop was officially opened in October by the President of the club, Lord Harewood and Mrs E Revie the late Don Revie's widow. The Gelderd End was renamed after the great manager himself and the stand is now officially known as the Revie Stand. Thanks to Tapani Olkku for this great pic.